Shaun Anton Wragsdale, 37, of Derby Road, Chesterfield. Pleaded guilty to stealing clothing to the value of £130 from Marks & Spencer. Community order made. John Alan Varley, 34, of Broadgorse, Grangewood, Chesterfield. Pleaded guilty to stealing two gift sets to the value of £160 belonging to Boots. Community order made. Ordered to pay £160 compensation. Janet Chantry, 49, of Station New Road, Old Tupton, Chesterfield. Pleaded guilty to stealing groceries to the value of £152.50 from Tesco. Discharged conditionally for 12 months. Ordered to pay a £20 victim surcharge and £65 costs. Simon Gary Pickard, 40, of Broadgorse Close, Grangewood, Chesterfield. Pleaded guilty to stealing toiletry items to the value of £48 from Boots in Chesterfield. Discharged conditionally for 12 months, ordered to pay £48 compensation and a £20 victim surcharge. Izabela Burys, 30, of Birchen Close, Brockwell, Chesterfield. Proved in her absence that she stole goods to the value of £154.95 from Tesco Extra in Chesterfield. Fined £200, ordered to pay £4.55 in compensation, a £30 victim surcharge and £85 costs. Mark James Meikleham, 37, of Saltergate, Chesterfield. Pleaded guilty to stealing a bottle of perfume to the value of £16 belonging to The Fragrance Shop. Community order made. Fined £40 and ordered to pay compensation of £16, a victim surcharge of £85 and £85 costs. Sharon Margaret Foster, 62, of Cross London Street, New Whittington. Proved in absence that she stole cosmetics items to the value of £31 belonging to Poundworld. Fined £40 and ordered to pay a £30 victim surcharge. Keiron Anthony Walker, 28, of Heath Court, Chesterfield. Pleaded guilty to assaulting a woman by beating her. Community order made. Ordered to pay £100 compensation and £85 victim surcharge. Duncan Carlile, 45, of Panthers Place, Stonegravels, Chesterfield. Found guilty of assaulting a woman by beating her. Fined £480, ordered to pay £100 compensation, a £48 victim surcharge and £620 costs. Ian Wyn Williams, 43, of Brassington Street, Clay Cross. Pleaded guilty to assaulting a woman by beating her. Community order made. Fined £230 and a £85 victim surcharge and £85 costs. Garry Newton, 47, of no fixed address. Indicated plea of guilty to failing without reasonable excuse to comply with requirements of the Sexual Offences Act 2003 in that he failed to notify at a designated police station his name, date of birth and home address within three days of his release from custody. Committed to prison for 16 weeks. Ordered to pay a victim surcharge of £115. Tomasz Josef Barcikowski, 32, of Field Drive, Shirebrook. Indicated plea of guilty to speaking to a person he was prohibited from doing so by a restraining order imposed by North Derbyshire Magistrates’ Court. Committed to prison for nine weeks consecutive. Restraining order made. Ordered to pay £115 victim surcharge. Graham Green, 58, of no fixed address. 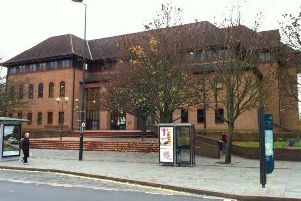 Indicated plea of guilty to entering Chesterfield town centre which he was prohibited from doing so by a criminal behaviour order imposed by North Derbyshire Magistrates’ Court. Committed to prison for 16 weeks. Matthew Payne, 25, of Wright Street, Codnor, Ripley. Pleaded guilty to contacting a woman he was prohibited from doing so by a restraining order imposed by North Derbyshire Magistrates’ Court. Fined £426, ordered to pay £85 victim surcharge and £85 costs. Matthew Henry Singlehurst, 22, of Foljambe Avenue, Walton, Chesterfield. Found guilty of failing to provide a specimen or specimens of breath for analysis when suspected of having driven a vehicle. Fined £525, ordered to pay £52 victim surcharge and £620 costs. Disqualified from driving for 14 months. Ashley Paul Wellings, 25, of Rotherwood Road, Killamarsh. Pleaded guilty to driving without insurance. Fined £200, ordered to pay £30 victim surcharge and £85 costs. Jonathan Richard Cleaver, 30, of Alfred Street, Pinxton. Pleaded guilty to drink driving, namely found with 69 microgrammes of alcohol in 100 millilitres of breath. The legal limit is 35. Fined £51 and ordered to pay £85 costs. Disqualified from driving for 18 months. Leon Tony Jackson, 41, of Netherfield Close, Matlock. Pleaded guilty to driving a vehicle while disqualified. Committed to prison for eight weeks, suspended for 12 months. Ordered to pay a victim surcharge of £115 and £85 costs. Disqualified from driving for 12 months. Ellie Brailsford, 20, of Broom Avenue, Pilsley, Chesterfield. Pleaded guilty to permitting a man to using a vehicle when there was not a policy of insurance in place. Fined £120 and ordered to pay a £30 victim surcharge. Driving record endorsed with six points. Michal Mogilka, 31, of Flamstead Crescent, Stonegravels, Chesterfield. Pleaded guilty to drink driving, namely found with 91 microgrammes of alcohol in 100 millilitres of breath. The legal limit is 35. Community order made. Ordered to pay £85 victim surcharge and £85 costs. Disqualified from holding or obtaining a driving licence for 36 months. Jill Elizabeth Tye, 50, of Mill Lane, Holloway, Matlock. Pleaded guilty to drink driving, namely having 91 microgrammes of alcohol in 100 millilitres of breath. The legal limit is 35. Community order made. Ordered to pay £85 victim surcharge and £85 costs. Disqualified from driving for 36 months. Aaron Cross, 24, of Broom Avenue, Pilsley, Chesterfield. Pleaded guilty to driving a vehicle while disqualified from holding or obtaining a driving licence. Community order made. Ordered to pay a £85 victim surcharge and £85 costs. Disqualified from holding or obtaining a driving licence for six months. Paige Nadin, 21, of Station Road, North Wingfield. Pleaded guilty to being drunk and disorderly in a public place. Ordered to pay a £30 victim surcharge and £85 costs.